I. 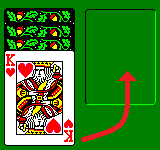 Rules For Moving Cards. 1. Creating Sequences. You can move any single card at the bottom of a column to the bottom of another column as long as the resulting sequence is in decreasing order from top to bottom. For example, in the image to the right, you can move the 2 on top of the 3, but you can't move the 3 on top of the 2. 2. Moving Columns. 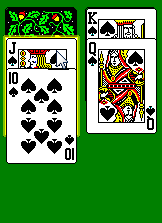 You can also move Columns of cards as long as they are in sequence and in the same suit. 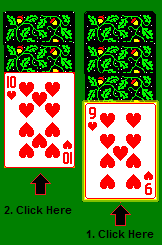 For example, in the image to the right, 10-9 of hearts sequence can be moved on to the Jack of Spades. 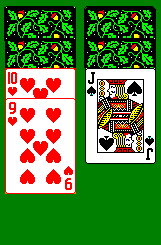 On the other hand, the 10 of Diamonds cannot be moved to the Jack of Spades because the cards below the 10 of Diamonds are not Diamonds and they are not in sequence with the 10 of Diamonds..
3. Moving To An Empty Column. Any face-up card at the bottom of a column can be moved to an empty column. Like wise, any sequence of cards in suit can can move to an empty column. 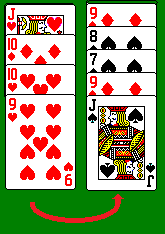 In the image to the right, the King of Hearts can be moved to the empty column to its right. II. Moving Cards. There are several ways to physically move cards in Arachnid. They all involve using the mouse to click or drag cards into position. 1. Drag Cards or Columns of Cards. You can drag any face up card at the bottom of and the column of cards below it to a new location. 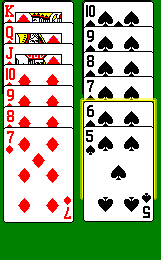 In the example below, the Jack-10 sequence in the left-hand column is being moved on top of the King-Queen sequence on the right. 2. Auto-Mode. Auto-Mode makes playing easier and quicker because it allows you make moves with a single mouse click. This allows you to test different strategies quickly. Auto-Mode can be enabled or disabled by selecting the "Options -> Auto-Mode" item from the menu bar. A. Home Position. If the bottom cards in the column form a complete suit (Ace to King) then the suit is moved to the Home Position. B. In Sequence, In Suit. 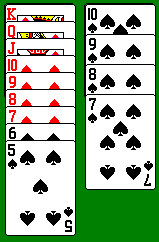 If the bottom cards of the column can be placed on a card of the same suit and in sequence, the card or cards will be moved there. C In Sequence. 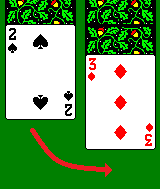 If the bottom cards of the column can be placed on a card that is in sequence but not of the same suit, the card or cards will be moved there. D. To An Empty. If there is an empty column, the card(s) will be moved there. If none of the rules listed above are satisfied, no card will be moved. To make the selected auto-mode option the default, use the "Save Defaults" option. 3. Click-Move From Place-to-Place. If Auto-Mode is disabled, you can move cards from place to place with two mouse-clicks. First click on any face-up card. The card will be highlighted. 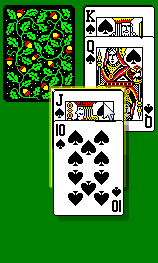 Now click on a face-up destination card. If the move is legal, the card or cards will be moved on top of the second card. 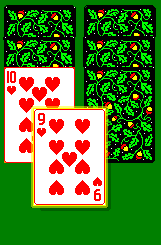 In the example below, the 9 of Hearts being moved on top of the 10 of Hearts, revealing the Jack of Spades underneath. 4. Splitting Sequences. 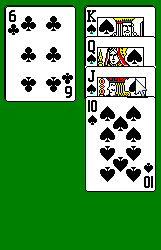 Sometimes it is useful to split a sequence of in-suit cards. In the original Arachnid game, you had to use the Right Mouse Button to do this. Arachnid-32 allows you to do it with either mouse button. You simply click on the card you wish to separate from the rest of the sequence and drag it (and the rest of the cards in the column) to the new location. 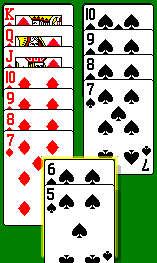 In the example below, the cards are being split at the 6 of Spades and dragged to put them on the 7 of Diamonds. 5. Undo. Any move can be undone by pressing the "Undo Button." The program remembers that last 1000 moves so it can undo 1000 changes, which is enough to roll back every move in even the most lengthy game.